A cautionary fracking tale from Pennsylvania — Let's stop fracking! About 10,000 unconventional gas wells have been drilled in Pennsylvania. Only six studies had been done on fracking when the first one was drilled. Nine hundred studies later, we know a lot more about fracking’s adverse impacts on health, safety, water, air, property values, quality of life, and climate. We know much of what we know because researchers studied what was happening in Pennsylvania. The data from Pennsylvania links low birth weight and high risk pregnancy to fracking. The data from Pennsylvania reveals that people in proximity of drilling are at increased risk of hospitalizations for cardiac and neurological conditions. The data from Pennsylvania indicates that chemicals used to frack or released as a result of fracking are carcinogens linked to childhood leukemia and other cancers. Witnessing firsthand what is going on in the Marcellus Shale in Pennsylvania moved legislators from New York to our north and Maryland to our south to impose statewide moratoria that have since become outright bans. We know so much of what we know because of what researchers and eyewitnesses were able to see with about 10,000 wells in the ground in Pennsylvania. But it is the industry’s plan to go on and drill at least ten times that amount in this state alone. Legislators from New York and Maryland were not the only ones to visit. We regularly get requests from media teams, researchers, students, public officials, and concerned citizens from around the globe who want to tour the shale fields of our state. In fact, the only ones who have no interest in seeing the situation on the ground are our own elected officials. No sitting governor has visited an affected community since former Governor Ed Rendell opened the state to fracking. Our regulatory landscape is a Wild West of incompetence, negligence, and complicity. Whistleblowers from the state’s Department of Health revealed that staffers had been handed a buzzwords list with verbal instructions to disengage from citizens using any of the words or phrases it contained in the course of filing fracking-related health complaints. After an audit of the Department of Environmental Protection (DEP), the Auditor General called the agency “woefully unprepared” to deal with the fracking boom. For more than a dozen years, Pennsylvanians have felt like test subjects in a live laboratory experiment. The present Governor Tom Wolf has served as head cheerleader for the natural gas industry. Last November, he introduced the PIPE program that moves $24 million from an alternative energy program to fund the building of the last stretch of pipeline needed to make customers of schools, hospitals, and business parks. His DEP has approved at least 47 new natural gas power plants for the state. He has granted Royal Dutch Shell an historic $1.65 billion in tax incentives to build an ethane cracker in Western Pennsylvania and has issued a report since that says the state could support four more cracker plants. In short, he has done everything he can to expand the customer base for all that shale gas nobody actually needs. It is in that same spirit that he has enthusiastically supported the MarkWest plant and the Mariner East pipeline projects that supply ethane to Scotland and other markets. In its blissful bubble of climate denial, the Wolf administration talks about 100 years of fracking and tens of thousands of new pipeline to come. I have met with the Governor and have personally challenged him to add up the side of the balance sheet he hasn’t wanted to acknowledge. Just the public health costs and legacy costs of having to maintain every well in perpetuity quickly erase any meager, and even then, exaggerated economic gains Wolf and other elected officials boast. Visit any of the impacted communities our governors continue to ignore and you’ll see nothing but the out-of-state vehicle license plates of the seasoned drillers sent here from other gas-producing states. 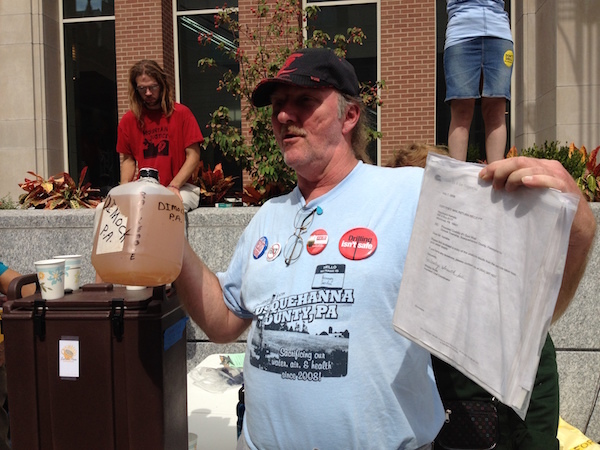 Maryland’s ban on fracking came less than two months ago. Last week, that state came one step closer to establishing the nation’s largest off-shore wind farm. It’s reminiscent of what happened in New York when real progress in the transition to renewable energy came on the heels of that state’s fracking ban. The only thing standing between us and the transition to renewable, sustainable energy is political will. When you fight fracking in Scotland, you don’t just prevent further fossil fuel development, you actually provide a very necessary shake up to the status quo. Keep it up and know that we in Pennsylvania are here to offer whatever support we can, even if it’s only our cautionary tale. I urge everyone in Scotland to seize the opportunity that you have been given and send a clear message that you reject fracking. This guest blog is from Karen Feridun, a founding member of Pennsylvanians Against Fracking.